So I picked up all four of OPI’s newest creation – Sheer Tint Top Coats. This new product line are designed to give your nails a sheer wash of color or you can layer over regular polish to transform or enhance the color. Also, since it’s formulated as a top coat, it’s super shiny and glossy. It’s basically lip gloss for your nails, and ya’ll, I love a good lip gloss. Right now, Sheer Tints come in four colors – Don’t Violet Me Down, I’m Never Amberrassed, I Can Teal You Like Me and Be Magentale With Me. 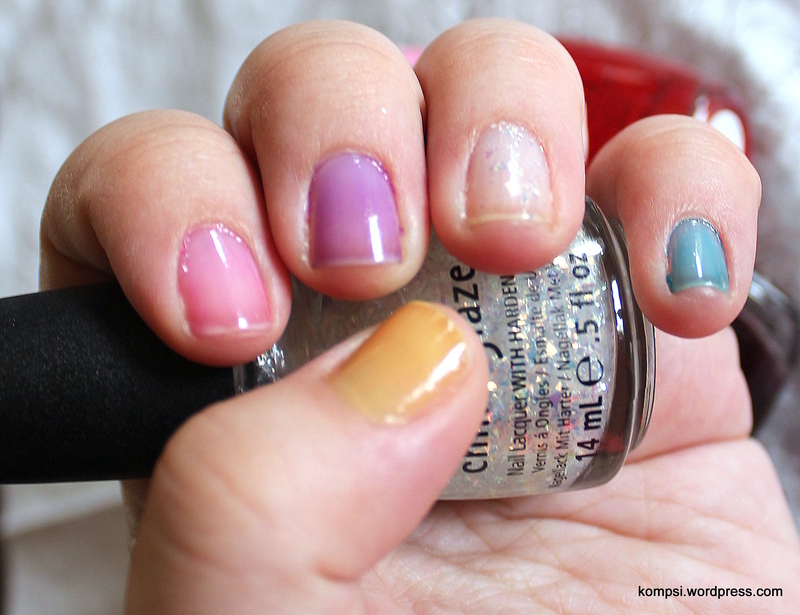 Wearing two coats of Sheer Tint on each nail, glitter is China Glaze Luxe and Lush. I can’t wait to try these tints on colored polish! I’m thinking using a tint on one nail as a accent or even over glitter polish to transform it. So many possibilities! My only complaint about these is that the yellow/orange shade sort of made my nail look like it was stained yellow, rather than wearing a polish. In sunlight, not so much, but in low light it looked sort of bad. But other than that, I love these!